Total War: Warhammer’s races are definitely getting wackier. Barring the Vampire Counts, the four races in the original game were differentiated less by their strategic mechanics than by their army rosters. But, since then, you can trace a steadily escalating line of wackiness via the Wood Elves, Bretonnia, Norsca, and the Skaven. True to this form, the Tomb Kings are a new , wacky peak – one that will tear up many of Total War’s fundamental rules when they arrive in Warhammer II on January 23. 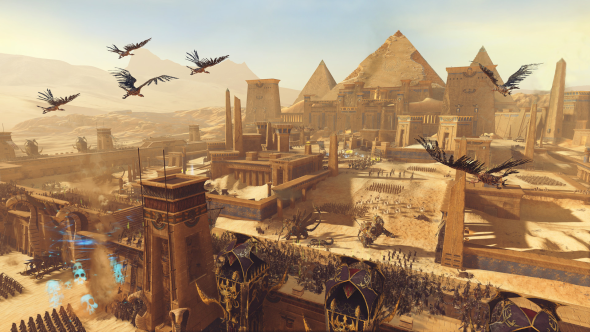 For a thorough breakdown of their mechanics, roster, and game tips, check out our Total War: Warhammer 2 Tomb Kings guide. You are wondering how they do this. Well, how about paying no gold at all to recruit or maintain your troops, just to begin? Every single unit is free. The only limitation is that most units have a cap, which you can only raise by building additional copies of their recruitment buildings. Tomb Kings may have a rich selection of tier five monsters, but each Hierotitan statue only lets you recruit oneHierotitan, and they cost 12,000 each. This will pose some exciting and novel challenges as the game unfolds: building slots will be hotly contested as your military capacity vies with your economy. And unless you build some capacity for a rainy day, you will notbe able to raise a decent defensive army at short notice. That is for later, though. 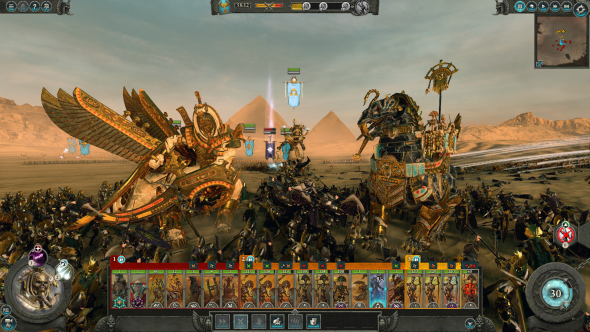 I start my hands-on time with the new race by picking Settra the Imperishable – basically the king of Tomb Kings – and filling his army with six trash-tier Skeleton units, and four elite Legions of Legend which have been especially unlocked in the preview build. 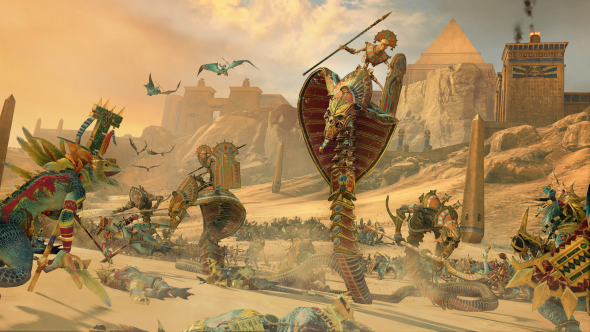 Combined with Settra’s starting army and his bonus units – Tomb Guard and a Warsphinx – this is more than enough to boot the Top Knotz Greenskins out of the Salt Plain, then Gor Gazan, and then Galbaraz. 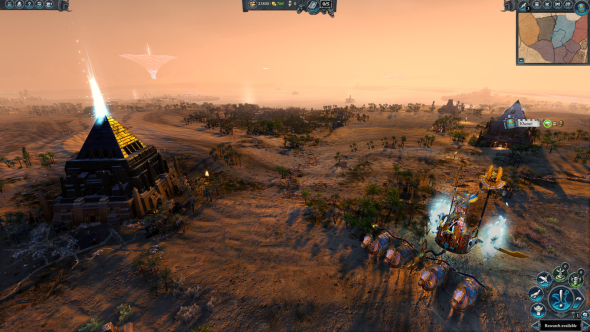 I then settle the uncontested ruins of Zandri, and I have gone from one settlement to five, across two unified provinces, within 30 minutes of play – and that includes a lot of poking around in menus. It is a rapid start, even allowing for the fact that I am only playing on Normal. It helps that I am fighting Greenskins, whose mediocre leadership and lack of armour at low levels makes them ideal opponents for the Undead. 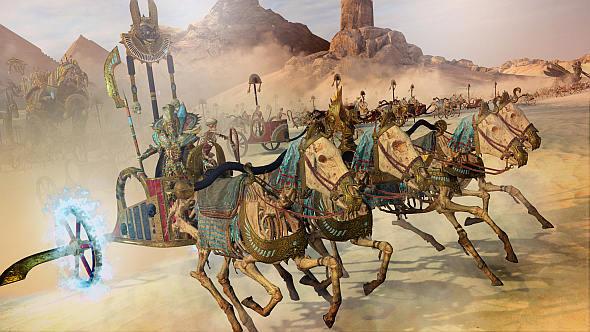 Tomb Kings have no armour piercing units until tier three – though this is by no means a unique weakness – so you will want to stay away from the Dwarfs and scaly-skinned Lizardmen for a while. Gold is running a little low by this point, and I realise this may prove to be the Tomb Kings’ first big speed bump. Even though this fearsome army has cost me nothing, there are still plenty of things which do – mainly, buildings. Tomb King structures cost almost as much as they do for anyone else, while income from taxes and trade is muchless generous. The upshot is that fighting for money feels very lucrative. Perhaps it was only a feelingborne of the miserliness of conventional income, but I swear the Tomb Kings get more from their post-battle loot than other races. In my brief extermination of the Greenskins, an open battle against Skafag Toof-Taka yielded 2,026 gold before I even selected the ‘Endless March’ option – the Tomb King equivalent of Ransom Captives – which granted another 855 and +20% campaign movement range for two turns. My conventional income per turn was a flaccid 180, at that point. So it pays to be on the warpath, which chimes with the lore; having been resurrected to a twisted version of the eternal life their priests had led them to expect, the Tomb Kings are an embittered, amoral group of tyrants, fighting to reclaim and rebuild their once-glorious empire. As a culture, they look both inward and backward, and this is reflected in two of their other mechanics: their tech tree, which is themed around their ancestral dynasties; and the Mortuary Cult. The Mortuary Cult is a shadowy cabal of priests – or liche priests, now that they are dead. Founded by Settra in life to discover a path to immortality – which one of their members, Nagash, arguably succeeded in doing – they now maintain the tombs of the kings and awaken them as needed. In game, they can awaken the aforementioned Legions of Legend – elite troop variants even more powerful than Regiments of Renown, to the point that they are not available in multiplayer for balance reasons. The Mortuary Cult can also craft magical items for your characters. You can browse the requirements for the Cult’s boons via a menu. This gives you something to work towards, rather like a Legendary Lord’s quest chain, or the Norscans’ book of monster hunts. Until now, Total War: Warhammer II’s magic items were trinkets that dropped after battles or treasure hunts, and often felt like little more than annoying notifications to be dismissed. As the Tomb Kings, they are objectives, and are more meaningful as such. The Mortuary Cult’s shopping list includes trade resources (gems, spices, iron, etc.) and canopic jars – the Tomb Kings’ unique currency – but I do not earn enough of either to have them craft me anything. I do, however, manage to unlock a dynasty. There are six of these to research, each of which unlocks several further technologies, all themed around a particular set of tactics. One of these techs will add a unique Lord to your character pool, with several powerful bonuses speaking to his dynastic theme. I opt for the First Dynasty, which contains various buffs for chariots and my tier two infantry, Nehekharan Warriors. Its Lord is Wakhaf, who gets +8 melee attack in desert terrain, +10% range for missile units, +16 charge bonus, +20% ambush success rate, and the Stalk attribute. That is pretty strong, so I am excited to build my second army with him. However, I am only able to do so after researching the first dynasty, because this has raised my army capacity by one. That’s right: as your units are capped, so are your armies – you get one Lord to start with, and have to acquire the ability to field others, either through dynasties or the Mortuary Cult. My session ends with a surprise attack from a rival Tomb King – they warred constantly in life, why should anything change now? – and a battle, which I win, but shamefully forget all about their Realm of Souls mechanic, which can trigger bursts of army-wide healing as you suffer losses. I have had only the smallest taste of the Tomb Kings’ campaign, but their intro cutscene shows me where it is headed. I mentioned they are inward-looking. They could not care less about Ulthuan’s Great Vortex, which is the fixation of the base game’s races. Rather, they are worried about the Black Pyramid – a magical superweapon built by the aforementioned Nagash, who also cast the spell which turned the Tomb Kings’ land of Nehekhara into a realm of the living dead. Where other races must harvest a special currency to cast five rituals, Tomb Kings must collect five of Nagash’s nine books from armies and settlements all across the world. These books can confer some exciting bonuses – one lets you recruit some Vampire Count units, for instance. When you are done, you have to take the Pyramid itself from a potent neutral army, upgrade its main building, and win a final battle there. When asked if we’ll ever see Nagash in the game, lead designer Rich Aldridge references the unique and“very climactic finale”to the Tomb Kings’campaign. I am not getting my hopes up, but that is certainly tantalising. You can see the rest of that interview in the embed below. It will be interesting to see how hunting for books compares with your rivals’ Vortex rituals from a pacing perspective. It is likely to be less expansionist: others have to take and hold ritual currency sites in the long-term, whereas Tomb Kings presumably just have to beat one army, or capture a settlement one time, to win its book. Taking certain settlements may involve a costly war – I note one book is ensconced in the Tower of Hoeth – but the only territory you need to hold is that which supports sufficient strength to hunt books and to defend your heartlands. It all neatly underscores that sense of looking inward and backward: the Tomb Kings’ obsession with the Black Pyramid that helped bring their ruin; their Mortuary Cult reawakening lost legions or artefacts; dynastic secrets yielding stronger soldiers and leaders; and armies swelling only as cities are rebuilt. It cannot have been easy. Variable strategic mechanics were unheard-of in Total War until the first Warhammer, yet here we are with a race that does not pay for recruitment or upkeep. But they still make sense, and moreover, they do so within the confines of a third-party IP. I have only had two or three hours with them, but so far it is a deft blend of game design and lore sensitivity that gets more impressive when you consider how conservative Total War has sometimes felt in the past. And yet the more CA rewrite the script, the more exciting it gets. I am no more than a tepid Tomb King fan – Vampires are cooler, let’s be honest – but I cannot wait to get my hands on them again. These impressions are based on a press day organised by Creative Assembly at which I got to play roughly two hours of a Tomb King campaign, but was only able to capture for 45 minutes. You can watch that footage on our YouTube channel.